Product #2785 | SKU SAMC1 | 0.0 (no ratings yet) Thanks for your rating! 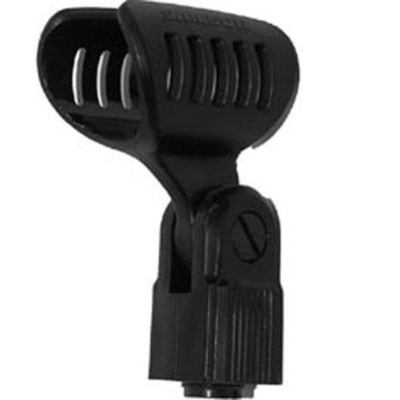 Samson's MC-1 Heavy Duty Mic Clip with Brass Threads (3-Pack) fits most average-sized handheld mics for stage and studio. This pack of three clips lets you mount a trio of microphones, or gives you a handy reserve in case you lose one on the road. These clips are made of tough plastic and are ready for hard use. Adjustable heads tilt so you can aim your mic where you want it. The Heavy Duty Mic Clip frees your hands and provides stability. End handling noise while maintaining a consistent mic position on the stage or in the studio. The Mic Stand Clamp fits average sized microphones, including straight-barrel dynamics and condensers. Tilt your microphone as desired using the adjustable hinge.